One fine example of a popular whetstone for keeping those knife edges razor sharp! Any good outdoorsman knows the importance of having a sharp high quality knife that they can rely on. A dull knife is not only a much less useful tool, but it’s less safe, as well. Many injuries occur from trying to put extra force behind a stuck knife in use, or having it deflect off something and skid out uncontrolled as a result. These are the times where a person most often gets themselves cut. A properly sharpened knife means smooth cuts and the maximum amount of control. Keeping a knife sharp can be a bit of a challenge if you’re new at it. No knife just remains sharp forever: you do need to but effort into keeping these blades at their absolute fines and that means frequent care and the use of a high quality sharpening stone. There are many great options out there, and this is a niche that is dominated by outdoor enthusiasts who hunt, fish, or enjoy wilderness survival activities. They understand the importance of a really good knife and pour that passion into creating some really outstanding whetstones. Trust me, there was no problem finding a long list of good options for this one! Not every sharpening stone is created equal. While there are many good options that can make it hard to choose between the truly premium whetstones, when you have hundreds upon hundreds of confirmed buyers giving perfect marks to one particular knife sharpener, you have to sit up and take notice. 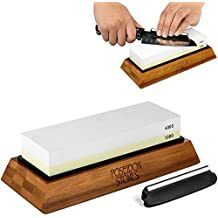 The Culinary Obsession knife sharpening stone is a truly top of the line whetstone that is designed to give you the ability to make knives sharp…maybe even sharper than the very first day when you first bought them. Sharper knives give more control, mean less errant cuts, which is when you’re most likely to cut yourself or hurt yourself. These outstanding 2-sided professional whetstones work for every type of knife imaginable and these even work for scissors, chisels, machetes, or even axes. In other words, it’s the type of stone that is designed to give you all the best option no matter what type of blade you need to get to a top cutting edge. Featuring a 1000 grit side and a 6000 grit side, the non-slip bamboo base helps make sure you are set when it comes to sharpening, and no oil is required. In fact, many report using basic water creates better results. Add in a 1-year warranty that includes a 100% money back guarantee. This stone even comes with instructions on how to get the most out of using it. 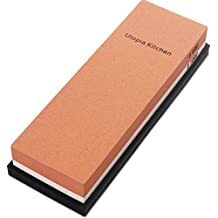 This is an absolutely phenomenal sharpening stone although if there is one (and if it does, it’s the only one) that competes with it for top spot, it’s the next entry on this list. The sheer quality of the reviews that have come in about this knife are nothing short of utterly extraordinary. The Sharp Pebble two-sided grit whetstone has a 1000 side as well as a 6000 side to offer the full range of tools you need to sharpen any knife to its finest honed edge. This isn’t just a simple stone, but a complete knife sharpening kit that is designed to give you everything you need to go from a pure beginner to a true pro at getting that beautifully trimmed cutting edge. This sharpening stone is designed to work with any type of blade and is durable to last a long, long time providing you with with the setup you need to enjoy sharp quality knives day after day, month after month, year after year. 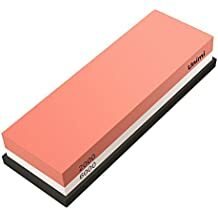 Not requiring messy oil, this sharpening stone is a true whetstone that is extremely easy to use and only requires water – meaning using it is easy, inexpensive, and a lot less messy than any oil based sharpening solution. Even with well over 700 reviews on Amazon, this sharpening stone is about as close to perfectly graded as a product can get, further reinforcing its place as one of the premium options that is currently available. The multi-colored double sided knife sharpening stone from Utopia Kitchen is an outstanding choice for an efficient and effective no frills sharpening stone that gets the job done so your kitchen or camp knives can remain at their sharpest. The stone itself sharpens both standard knives as well as knives with serrated edges. The stone itself is 7 inches long, 2.4 inches wide, and 1.06 inches tall. It is double sided meaning it offers two different grit settings depending on the type of knife and sharpening you are doing. One side is 600 the other is 1000. The sharpener even has a rubber bottom that is slip resistant, making it easy to hold and handle the sharpening stone while using it. This setup is perfect to enhance your results since you don’t have to worry about a slipping or sliding stone resulting in uneven strokes on the whetstone. Whether you’re looking to sharpen kitchen knives, pocket knives, or outdoor knives, you will be happy with the results you can get from the Utopia Kitchen knife sharpening stone. This is great for daily maintenance or whether you need to bring a badly dulled knife back up to par. Even better: it works with steel and ceramic knife blades. 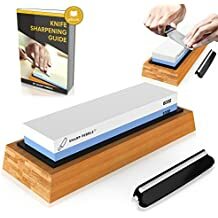 This is an excellent knife sharpening stone and is going to be especially popular with those of us who learned to use a sharpening stone by holding it as opposed to setting it. The only major con is that this model is popular and can be prone to selling out on Amazon so it won’t always be available. The Unimi professional whetstone looks similar to the Utopia Kitchen whetstone aesthetically, and while the two basically function in the same way, the good news is that Unimi also brings that high quality level to their whetstone, as well. While similar in appearance these are two different sharpening stones and each needs to be considered on its own merit. The Unimi professional whetstone is a combination 2-sided stone with 2000 Grit on one side and 6000 Grit on the other. This allows for a stone that can provide fine honing as well as a razor-sharp finish (great for fillet knives). Just use one side and then the other for that perfect finish. 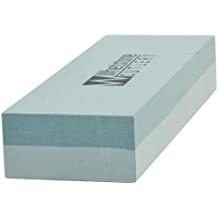 This stone is made from premium white corundum which resists corrosion, heat, and friction damage meaning this is a high quality sharpening stone that is built to last. A non-slip silicone base is there for safety while sharpening, and a sharpening guide is included so even pure greenhorns will be able to figure out how to sharpen their blades to their absolute best, while old hands can check on the technique. This is a fantastic all purpose knife whetstone that is well worth the price. The 2000 Grit side for fine honing can repair even most heavily damaged edges and can turn blunt knives into sharp blades once again, while the 6000 grit side is for razor sharp polishing by eliminating the burrs of the edge for a smooth and truly razor-sharp edge. 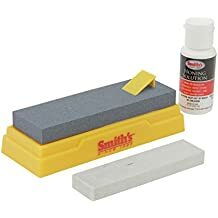 The traditional name that is synonymous with a truly high quality whestone, Arkansas Smith sharpening stones have been around providing true quality for decades and are among the most popular (and most reviewed) whetstones you will find anywhere online. For good reason, too! These outstanding knife sharpening stones have truly earned their reputation for being one of the best. This Tri-Hone sharpening system includes 3 total whetstones: 1 Medium Arkansas stone, 1 Fine Arkansas stone, and 1 coarse synthetic stone. These stones are mounted on the molded plastic triangle and appear aesthetically very different to make them easy to rotate and identify. This ingenious system allows you to quickly find the stone you need for this sharpening job, set it firmly in place, and then to sharpen using the correct angle every time. This system makes it easy to find the actual stone you need for the type of sharpening that is needed at the moment. This is an innovative design to make the most out of classic quality. The V trough also allows for easy catching of oil drippings, like from the included bottle of Smith’s premium honing solution that is included with this system. Next on the list of top notch whetstones for knives is this sharpening stone set from Poseidon Stones. 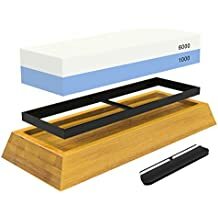 This sharpening stone set is the equivalent of offering two stones in one, with a 1000/4000 Grit split so you can use the stone you need for your specific sharpening goals whether that is repairing an old, dull, and damaged knife or putting the final cutting edge to make a knife truly razor sharp. The sharpening set is the complete package with a solid anti-slip bamboo base, the exceptionally built and designed sharpening stone, and sharpener made from aluminum oxide to stay effective longer. This sharpening whestone uses water over oil, making it easier and less messy to end up with the solid razor sharp blade you’ve been wanting. Most people prefer the water ones over the oil, which makes this yet another feature that most buyers will appreciate. Many buyers love the versatility and high quality build of this stone which allows for every blade to reach its potential whether a straight razor, pair of metal scissors, kitchen knife, pocket knife, or blade of any kind. This is the type of stone that can handle them all so you won’t be disappointed. Finally, it comes with a full 1 year 100% satisfaction guarantee or you get your money back. That’s a solid warranty that will make sure you get to see what this whetstone can do after multiple uses. Taking advantage of the very popular and common two-sided whetstone design, this is a very popular option put out by Whetstone Cutlery and it’s not hard to see why. One side is a light green and rated at 1000 grit while the other half is darker and 400 grit, giving you the full range of options for whatever you need. The 400 grit side is perfect for rough grinding and returning edges back to their original shape and sharpness while the 1000 grit side is perfect for polishing, smoothing, or even fine finishing of whatever blade or cutting edge you’re working on. This two-sided rectangular stone block is easy to store, easy to use, and helps you both sharpen and polish your blades to look their absolute finest. The blades will also be in their tip top shape. This is a water based stone so not only should it be submerged in water for 5 to 10 minutes before using, but you will also want to continue to apply water throughout the entire sharpening process. At that point you just need to keep sharpening the blade at the right angle to keep getting the finish you want. There is one potentially big negative with the design. One side is light green and one side is a slightly darker green…so color blind, anyone? This can be an issue for those of us who have troubles telling shades of green apart. If you can see it in the picture here you’re probably fine. If it looks like one color – time to look for another option. Combination sharpening stones are definitely in vogue, and it’s easy to see why because the ideal stone for fixing past damage and dullness is a lot different than the perfect stone for taking a sharp knife and finishing it off to create a truly intense and razor edge. This sharpening stone from BORA is made out of aluminum oxide and is a compact 6 inches long. One side is coarse will the other is a fine grit set up, allowing for the one stone to work to sharpen all edges. The smaller size of this makes it ideal for fast bench work. 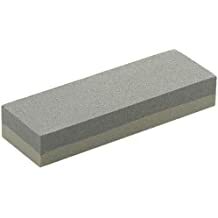 This is a more basic whetstone than some of the others on the list with a 150 grit for final honing and touch-up work and the fine side being 240 grit and ideal for removing nicks or basic sharpening. Offering a one year warranty, this is a great beginner’s whetstone for sharpening tools, knives, or whatever other blades you need. This is also a popular option for individuals who need a good sharpening stone that takes up minimum space and won’t bust up the budget. This is the least expensive of the options on this list – a true budget whetstone option. An established name and model in the outdoor field, don’t let the somewhat cheap aesthetic appearance of the mount fool you: this is a high quality Arkansas stone that offers premium honing to your blades. The Smith company is a recognized name, having provided high quality whetstones since 1886. They are especially well known for being a premium option when it comes to sharpening blades of any kind. 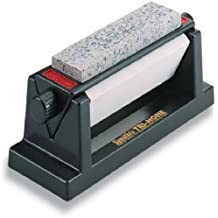 This is an oil based sharpening stone, and the combination of a fine Arkansas stone and proper use of oil means the least amount of metal gets removed from the blade or tool while the sharpening process takes place. In other words: it’s designed to get the job done. This whetstone setup comes with two sharpening stones in addition to a small bottle of oil so you can start sharpening blades right off the bat to get the cutting angle that you’re looking for. Highly rated yet budget friendly, there’s a reason this option makes our list of the top rated sharpening stones out there. Tarvol has gained a lot of attention recently with their contribution into the whetstone market. 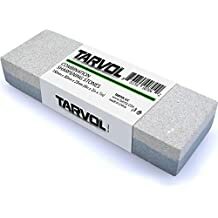 The Tarvol Knife/Tool 2-sided stone for sharpening blades and edges is an inexpensive and versatile solution that gives you all the tools that you need to make sure your knife is sharp and in prime condition for whatever you need. A medium grit side of 120 and a fine grit side of 240 means that no matter how much work you need done on your knife or tools, you will be able to get it done. Made from aluminum oxide and resistant against wear, this Tarvol stone is good for sharpening knives, scissors, tools, and other utensils. In other words, it gets the job done the right way. In addition to being capable of being used either wet (with oil) or dry, Tarvol guarantees its products and that means a 100% money back guarantee from a manufacturer if you aren’t satisfied for any reason. As of this writing, Tarvol guarantees its products for life. A great final option for our list of top rated whetstones currently on the market. Q: Do I need a special oil to properly sharpen my hunting knife? A: This is a maybe, maybe not. Why is this the case? The traditional whet stone would use a combination of the special stone along with the right oil to create that strong edge. There are modern versions that don’t necessary require oil, but many knives come with both. Q: Why are sharp knives safer? A: Two main reasons. The first is that a dull knife is much harder to control, often leading to mis-cuts, bad cuts, or an errant motion that results in possible injury. The second is that a sharp knife requires less force. More control and less force means it is much less likely for you to get injured. Q: Why does the angle or degree matter? A: This determines how effectively you sharpen a blade. A good angle means an especially sharp knife or edge. A bad angle makes your efforts far less effective. Q: What level of grit do I need? A: There’s a wide variety of grit levels available. The key is to pay attention to each one to make sure you have the type of stone you need for the type of sharpening you’re going to do and then decide how much of a difference basic versus premium makes for you. Q: What is the most important thing to look for in a sharpening stone? A: The biggest part for the stone itself is finding the ideal grit for what you will most often specifically be using the whetstone for and to make sure that matches. Even more important than figuring out the basics of the whetstone is to make sure you are using proper technique to get the most out of the stones you have to use. There are many different great sharpening stones out there, and what works perfectly for one individual might not be popular with another. While many whetstones are at least similar in nature, the most important thing is how comfortable you are with a particular stone or style of sharpening knives. The more comfortable you are using a stone with your favorite knife, the better the results you’re going to get. While there are some differences, and unfortunately there are some really cheap options that aren’t going to give you what you need to use proper tools and techniques to get razor sharp knives, but as this article shows there are an incredible number of verified high end sharpening stones. Find the one you’re most comfortable with and run with it. As long as you have a high quality stone there won’t be much difference most of the time between the best and tenth best. The most important factor is becoming comfortable with the stone you use and the actual sharpening process.